Fair trade coffees and teas produced by slave labour,The indignity of used underwear and old spectacle frames sent away to Africa. This is charity. Gadgets bleeding Congolese Blood. No way, it’s those rebels spoiling it for everyone. No need for aid. Africa is perhaps the richest continent. But you need our assistance to reach our levels of development and democracy. British business dispossessing thousands to bring development. Understand this, New Forests Company is simply creating jobs. Brits love woods, and giving people a chance at better lives. Arms exports from the UK fueling instability back home. What!? 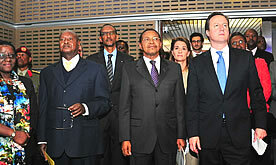 The latest is a picture of Dave and the Despots at a family planning conference. I say, it’s a ruse to talk about GOD. Tut tut, God doesn’t approve of family planning. Gold Oil and Diamonds. Silence. First things first; UK Plc is owned in part by Middle Eastern Money, Russian Oligarchs, Tropical Despots, American Muscle and the ChIndian Corp. Business as usual you can’t fight it, you can only try to understand it and not get bitter about it.